Dirty gutters are one of the most concealed ways a home can suffer water damage. When your gutters fill up with debris and dirt, the water tends to overflow onto your home, leaking down the walls and causing expensive water damage. That’s why you need to have your Etobicoke home’s gutters cleaned every year by professional gutter cleaners. NICK’S Window Cleaning Company has been cleaning gutters and eavestroughs for over a decade. Equipped with the right training and tools we can clean your entire gutter system, including eavestroughs, soffits, downspouts and fascias. We also carry full liability. Dirty gutters actively disrupt the way water flows away from your home, leading to expensive water damage from the roof all the way to the foundation. 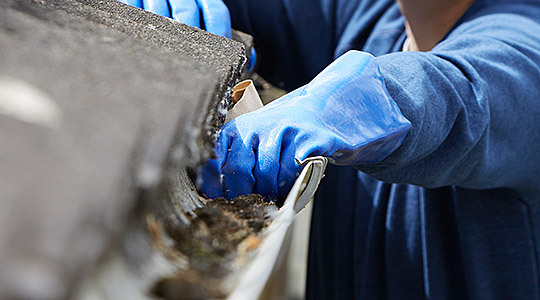 These repairs are often time consuming and very expensive, which is why it pays to keep your gutters clean and in perfect condition. NICK’S Window Cleaning Company makes regular gutter cleaning simple and easy. With our state-of-the-art scheduling system, we will clean your gutters at the appointed time, so you never have to worry about making an appointment. If you’re looking for eavestrough cleaning Toronto residents trust, you’ve come to the right place! Gutter sealing: Our high quality sealant will help extend the life of your gutters by sealing up any leaks. This will keep water flowing the right way and protect your home from water damage. Downspout guards: A one-off service that install guards on your downspouts and gutters. This helps make drainage more efficient. Eavestrough flushes: By flushing all of your gutters and eavestroughs, we can find out if your gutters are leaking. Once we do, we can fix or replace them to ensure your eavestroughs are working at maximum efficiency. At NICK’S Window Cleaning Company, we believe experience and care is the secret to cleaning. All of our staff are trained to wash out your entire gutter system by hand, including eavestroughs, gutters, fascias, and soffits. This ensures that every piece of dirt and debris is safely removed from your gutters and eavestroughs. For more intensive jobs, like post-construction gutter cleaning, we can also use our specialty cleaning formula. Tough on dirt and gentle on your gutters, this liquid cleaner can dissolve even the toughest stains. The end result are beautiful and functional gutters and eavestroughs. We recommend that you get your eavestroughs cleaned every spring and fall. The reasoning is simple: water in unclean gutters is damaging in different ways depending on the season. In the spring and summer, water in unclean gutters will sit inside and seep into everything. This can lead to rot on any nearby wood and even ruin your roof tiles. The water can also leak down into your home, causing flooding and even foundation damage, which is an extremely expensive cost. The additional weight in the gutters due to standing water can also lead to warping and bending. In the winter, any water left in your gutters will freeze and expand. This can severely damage your gutters and even break them entirely, leading to costly repairs. The frozen water can also cause the eavestroughs to separate from your home, falling off and potentially injuring anyone caught underneath. Providing full gutter & eavestrough cleaning services in the Etobicoke area, NICK’S Window Cleaning serves both commercial and residential properties up to a maximum height of 3 storeys. Our team will ensure that your home or business looks it’s best, not to mention has a clean eavestrough allowing for proper drainage. Our team is skilled, insured, and professional. Your satisfaction is the top-priority of our service, we look to build long-lasting relationships with our customers and thus deliver exceptional quality services. Need your gutter or eavestrough cleaned? Give us a call and discover why more Etobicoke residents are turning to NICK’S Window Cleaning. Falls from ladders are one of the most often reported injuries among homeowners. Cleaning out the eavestroughs on your home requires that you spend a lot of time on a ladder. The ladder in your garage that you haven’t used in five years isn’t a terribly reliable ladder to use to clean your eavestroughs. Professionals have commercial grade ladders and know how to safely climb and work on ladders. For your own safety and peace of mind it pays to hire a professional. Another reason why it’s smart to hire a professional to clean your eavestroughs is that a pro is going to get better results than a homeowner. Cleaning out eavestroughs is dirty work. There are leaves, sticks, dirt, standing water and other debris in there. You might even find rodents or insects living in there. Do you know how to deal with rodents who have made a nest in your eavestrough while you’re standing on a ladder? Professional do. Let them clean out your eavestroughs so that you know you will get the best possible results quickly. Standing water trapped in eavestroughs leaves your home at risk for exposure to mold. Mold can grow in almost any wet conditions and it gets inside your windows, cracks in your home, it even get into your home’s foundation. Once your home has mold it puts you and your family at risk for serious health problems. It’s difficult and expensive to get rid of. The best way to avoid mold problems is to get your eavestroughs cleaned regularly by professionals. Eliminating standing water will protect your home from developing mold.